Spice up your wedding invitations with a simple frog fastener. Here we have a really simple DIY wedding invitation project using our flexible eastern promise invitation design. 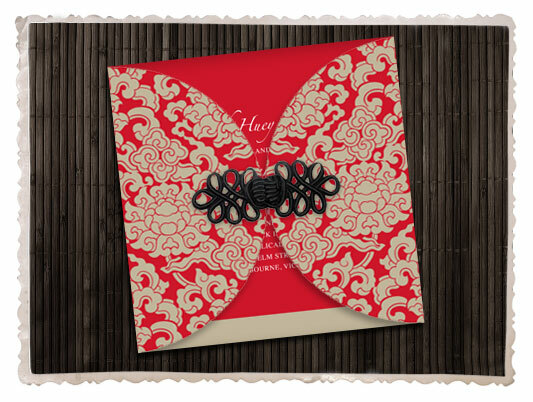 Begin by printing out the invitation front and back, then mark up a semi circle on each side for the flaps. Trim the invite top and bottom and cut around your semi-circle flaps. Fold, and glue a simple frog fastener to the front with strong glue. If you don't like the fact that you can see the invitation wording underneath you can always slip an extra piece of blank card or coloured rice paper in between.